In the first part of this post I described on how to prepare a your existing Exchange 2003 environment to run get it ready for the first Exchange 2010 server. In this post we I am going to talk about the installation part of the Exchange 2010 which is not very much difficult when you have your organization prepared and its schema extended for Exchange 2010. Before even going to start installation of your Exchange 2010 server you still need to consider few things like; the support for legacy exchange clients like outlook 2003, and the legacy routing server which is supposed to be a bridgehead server in your exchange 2003 organization. Once you have made a decision about these things you can now proceed to installation. In my previous post I said it would be easier for your to go with GUI based installation but if you are planning to install support for legacy outlook clients you will need a public folder database which is not created by Exchange 2010 by default and you have to choose this manually. So, in this case I would prefer and also recommend going with a setup.com command line installer which is full of features (command line options) and can also be scripted if required. A notable thing here is if you really want to enable the legacy outlook support on an exchange 2010 server you must specify when you install the first Exchange 2010 server in the organization. By any chance if you have skipped this stage of defining this requirement you can create a public folder database manually and then replicate Free busy public folders to this new database on your Exchange 2010 PF database. So, are you prepared? If you think you are then lets start installing the first Exchange 2010 box in the org. I will do it both ways, the command way and the GUI. Due to restrictions of hardware resources I installed just a server with MBX, CAS and HT roles on it. So here is how I did it. Above command line will install CAS, HT, and MBX roles on the box where it is going to enable the legacy outlook support by creating a public folder database on it. /LegacyRoutingServer refers to a bridgehead server in your existing Exchange 2003 organization. You can specify the FQDN of this server after the switch. /ExternalCASServerDomain will be the domain that will be pointing to your Exchange CAS server. In GUI you get above mentioned options at following screens. Exchange 2010 RC GUI didn’t provide any option to specify the legacy outlook support though. Now once you have selected these two very important options you can simply read through the GUI wizard and proceed with other steps and start installation. Here is something interesting, if you ever asked yourself a question that why would exchange 2010 setup ask you to provide this information about the external domain name then the answer is below figure. Exchange setup will automatically use this name in the properties dialog box of the OWA website and you don’t need to configure it manually unless there are any changes in your domain name. The next step is to verify the mail flow between legacy server and the newly installed Exchange 2010 as well as the OWA accessibility. In my current setup I have Administrator’s mailbox on legacy server and the Exchange Geek’s mailbox on Exchange 2010 server. To perform this operation you must have SSL enabled on your Exchange 2003 OWA website as well as the form based authentication configured.Though the redirection will take place automatically on Exchange 2010 you must configure your ISA boxes or firewalls for this redirection. In next part I will write about rest of the stuff about configuration like OAB and Free/Busy information and other. Till then do let me know if you find any kind of documentation bug or mistakes in the posted entries. This entry was posted on 06/11/2009 at 2:40 PM	and is filed under Exchange 2010, Exchange Server 2003. You can follow any responses to this entry through the RSS 2.0 feed. Both comments and pings are currently closed. Thats very useful and detailed document. thanks. Hmm, not sure I understand.. I am unsure how to do this, have 1 mailbox on exchange 2003 and 1 on exchange 2010? How do I achieve this? However I am not sure how to set 1 mailbox to live on exchange 2010 and 1 to live on 2003. I want to move over to 2010 but only do so once I know its working. Hold on, somehow after reading that article _everything_ just clicked in my mind.. The reason mine never worked was the account was living on Exchange 2003, I created the account on 2010 and Vwala (OWA works) / Exchange works. Thanks for the very well wrote article!!! I quite didn’t understand the terminology of having Bridge Hub Mode. Could you please help me understand that first? Also, whatever your exchange 2003 configuration is you must have at least one HT+CAS+MBX server roles installed. Only this configuration should take care of your requirement under any circumstances. However, you must make sure that you specify your Exchange 2003 bridgehead server during the setup. So, as an example if you are installing Exchange 2010 HT+CAS+MBX server roles on the same box your command line should contain the /LegacyRoutingServer parameter value pointing to your Exchange 2003 bridgehead server. You can also refer my Transition Guide in Downloads section for more information. I never did it during exchange but I did create it with powershell after install. All seems, to be working nicely now, I know this isn’t a forum but you seem to be the only person I have come across that understands this so well. I want to now phase out the Exchange 2003, I have tested that OWA and Exchange works to the 2010 Server. Can I now just copy over the mailboxes and then just change the DNS (record) of the current exchange 2003 to this new 2010 ? This way I wouldn’t need to change anything on the client PC’s ? No problems 🙂 I am glad that it helped you. 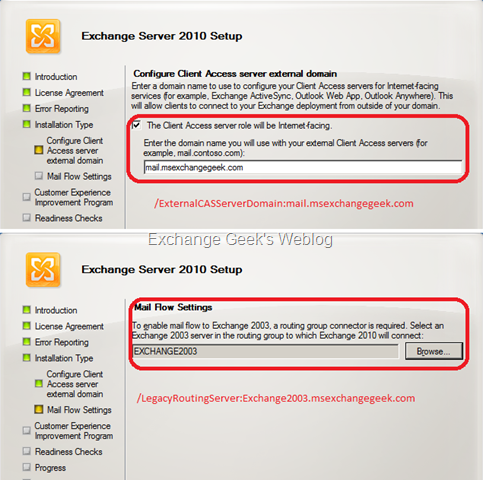 As I said in my previous comment you can refer my transition guide for phasing out your exchange 2003 servers and you might need to reconfigure your outlook profiles after that. Man that article was AWSOME!!! Just completed it, and everything seems to be working. I am going to take your advice and down the server for a few days once these mailboxes have finished moving across. You have not by any chance written an article on (Replication / high availability) for 2 Exchange 2010 Servers… If one goes down, mail is still delivered. Thanks again, I have been waiting a few days now for a request to be answered on an Exchange forum and the answer was here all the time.